Moist: Australian watercolours was not a history of watercolour painting in Australia. 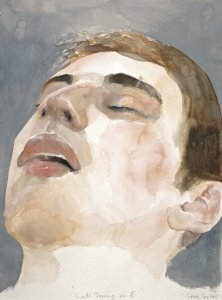 Instead it focused on the liquid nature of watercolour, and how a diversity of artists have experimented with the medium to create unique representations of physical, emotional and atmospheric conditions, ranging from those that are highly figurative to images of a purely abstract emotional intensity”: 90 works from the colonial period to the present. It was an eclectic mix, with finely wrought classic landscapes and modern work of startling variety.